We offer our parishioners the opportunity to receive emails with special announcements and parish information. If you would like to be added click here and complete the form. Good Deed Friday is based on a simple idea that every person can do a good deed for the benefit of others. Even a smile that brightens someone else&apos;s day is a good deed. Send us a good deed that you have experienced or have seen – no matter how small. 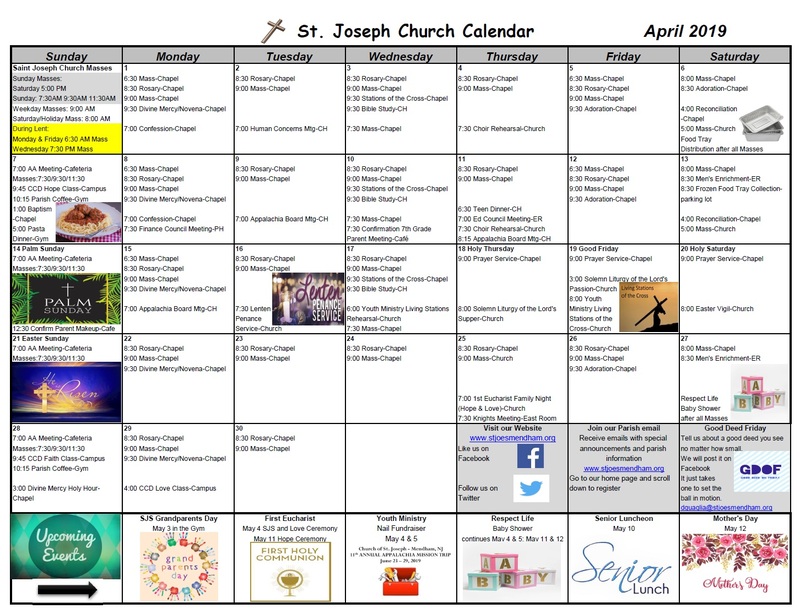 We will post it on Saint Joseph Parish Facebook page on Friday. To Enable Parishioners to Live Their Christian Vocation in the World. The Catholic community of Saint Joseph is more than just friendly people, good homilies, and interesting activities. Most importantly, we gather around the person of Jesus Christ to worship God and live in the light of the Holy Spirit. The community of Saint Joseph comes together with the Holy Spirit at Mass, in the Sacraments, and in parish activities to pray, to celebrate joys, to mourn losses, to serve others, to provide support, and to receive strength for daily life. Our community recognizes the importance of walking with others toward the union with God.